Server Gated Cryptography was created in response to US government legislation on the export of strong cryptography in the 1990s. Microsoft developed Server Gated Cryptography and Netscape developed "step-up" technology to enable 128-bit SSL encryption with export browser versions. However in 2000, US Export law was changed to allow the export of strong crypto and Microsoft released IE 5.5 and IE 5.0.1 SP1 which allow those browsers to connect at 128-bit without using an SGC SSL certificate. 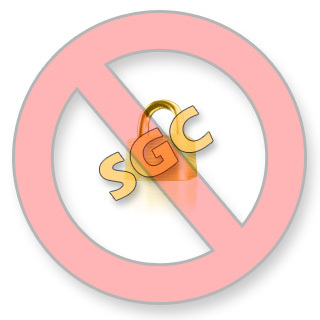 By requiring users to upgrade their browsers to one that supports 128-bit encryption without SGC SSL Certificates (Internet Explorer 5.0.1 SP1 and later), you will not only be better protecting your vistors from attacks on your own site, but you will be helping them protect themselves from attacks on all other websites. Certainly, that is worth more than what you receive from allowing users to believe they are secure when they really aren't? Considering PayPal's recent harsh treatment of older browsers, we should all reconsider how much old, insecure technology we should allow.The choice is up to you, but we highly recommend that you Say No To SSL SGC Certificates. Entrust has written an article including many of these same points in The Myth of Server-Gated Cryptography (SGC).